We are Pleased to inform you that visit such a most reliable platform in order to get complete preparation with respect to english subject for educator posts. Here Online mcqs type quiz has been dispatched for NTS written test. By following the below mentioned quiz you can easily take remarkable marks in concerned subject as well. Just attempt the quiz for rehearsal within specific time as designed.After attempting you will automatically the score card on your computer screen. In such a way you can easily assess your capability understanding and knowledge about subject. English is the Compulsory Subject in Pakistan because it is the International Language and when we communicate with foreigners or any of the other country residential then we use English because it the central channel to connect each country residential to communicate So we can get the English Test preparations Online on this page of gotest.pk because these test we made according to the NTS Testing Syllabus. Above dispatched quizzes are most important with respect to their applicability and validity as well.These are made according to new pattern and recruitment policy of the education department. 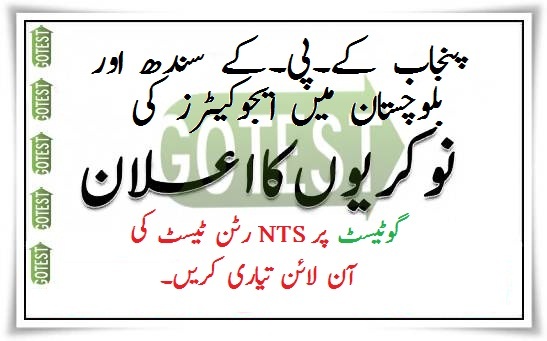 You can rely on all such quizzes in order to take graceful marks in NTS written test.